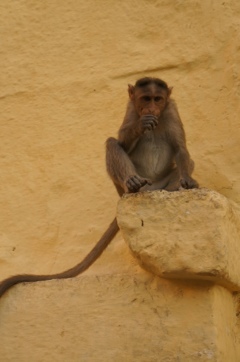 It’s a wrench to leave the jungle retreat so soon for the bus ride to Mysore. Driving back through the border to Karnataka I am still looking for tigers (you never know, right?). The jungle landscape soon gives way to open farmland. 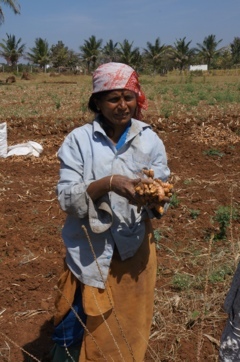 In one field, women are harvesting turmeric. We arrive in Mysore and check in to our hotel – KVC International. The street isn’t up to much, but it’s easily the nicest hotel we’ve stayed in so far, huge clean rooms with a TV and an ensuite (with hot water! ), and even free wifi. But there’s no time for that – we are off to the palace! 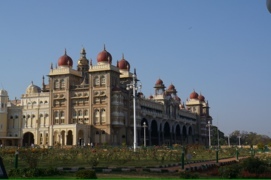 Mysore Palace is a confection of a building set in huge grounds planted with palm trees. To go inside we must surrender our cameras, and leave our shoes in a locker. We are accompanied by a guide, Samir, who sounds like he has learned English from a member of the Russian mafia, and who cracks tragic Dad-jokes at every opportunity (to wit: when describing a goddess with 36 arms, he has himself in stitches because “my girlfriend has only two arms”. There will be mother-in-law jokes any second now, I’m sure of it). The palace itself is quite something (even if Samir is a little too impressed with a couple of paintings where the eyes of some of the animals follow you from one side of the room to the other – the Indian Mona Lisa, apparently. Actually, no…). There is a vast galleried ballroom with stained glass all the colours of peacock feathers, and a public audience gallery/throne room which is open to the elements. There is a solid silver howdah, and photos of the Maharajah atop an elephant in the midst of a parade. It is hard to believe that the current palace was only built in the early 20th century. 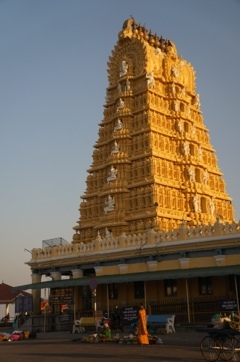 It is nearly 4 o’clock, and, back in the bus, we wind our way up Chamundi Hill, on the edge of town. The bus shows every sign of having no brakes, which is fine on the way up (save for one or two near misses), but a little disconcerting when I remember that we also need to get down again. At the top of the hill lies Sri Chamundeswari temple, dedicated to the goddess Durga (whose mode of transport, incidentally, is a tiger). Leaving our shoes in the “clock room”, we have just enough time to enter the temple before it closes. As we squeeze past the gate I feel someone brush past me, then look up to my right to see a disgruntled-looking macaque staring back at me, before moving on to the next person in the queue – he had been busily inspecting the offerings brought in by each pilgrim, helping himself to the choicest morsels, and had registered his disgust at my empty hands by giving me a swift roundhouse kick as I passed. Inside the temple we make a swift circuit, and I attempt to dodge the priest dishing out blessings for a small “donation”. 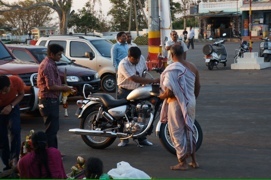 Outside, there is a young guy having his shiny new Royal Enfield blessed by a priest. He blesses a coconut, then sets it behind the back tyre for the proud owner to reverse over, which he does – oh the embarrassment if he’d tried and it hadn’t broken, with all of his friends (and twelve curious tourists) looking on! From the hilltop, the view of the sun setting is magnificent. As it sets, we descend the steps nearby, to see the large monolithic bull (Nandi) at the bottom – Durga is an incarnation of Parvati, wife of Shiva, and wherever there’s a connection to Shiva, there’s a bull. On the way we pass school kids on their way – surely home, at this hour? – and they delightedly try out the few phrases of English that seem to be the mainstay of English teachers throughout India: Hello, where are you from, what is your name? In taking the steps we’ve also neatly avoided finding out how the bus driver gets down the hill without any brakes! 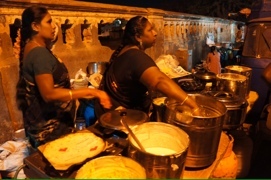 For dinner there is a treat in store – in the evening the street near our hotel comes alive with a line of tiny food stalls, and our guide has already scouted them out, so he knows exactly which ones are safe. 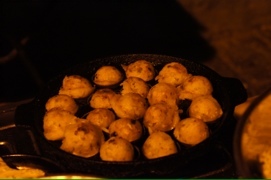 We watch as piping hot savoury pancakes mixed with onion and corn are grilled on a hotplate, while little balls of deliciousness called ‘panniyarum’ (like takoyaki without the octopus) cook in a specially moulded tray. 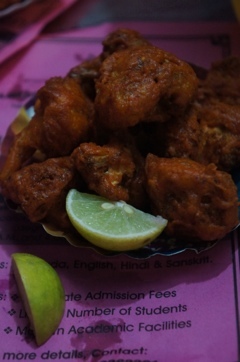 A little further down spiced, battered cauliflower is being fried in oil, and served with a twist of lime. Mysore is famous for its silk, so the next morning there is a shopping expedition to a government emporium (mostly fixed price, but at least the quality is guaranteed), followed by a visit to the markets, but my wretched cold is still making its presence felt and I need some downtime – I’m really enjoying the group so far, but there is a definite sense of relief at having a few hours totally to myself. 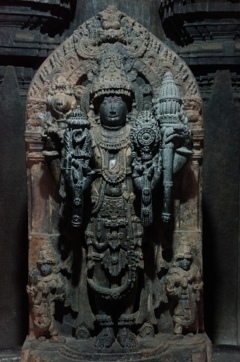 By the afternoon I’m ready to play again, and we drive out to the Keshava Temple, an hour from Mysore at Somnath. 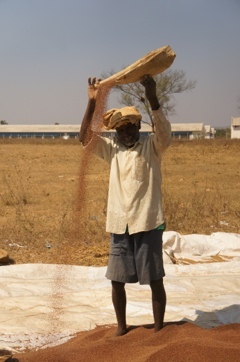 On the way we pass more farmland, and stop to watch millet gleaners shaking the last valuable grains from the harvest. 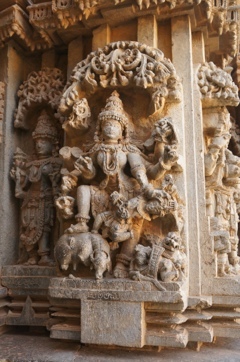 Keshava temple was once dedicated to Vishnu (in one of his nine incarnations), and the inner sanctum contains three statues, which our guide names as Krishna (by another name that I couldn’t pronounce let alone spell), Keshava and Janardhana. Two of the statues are original, the third, “stolen by the Britishers”, now lies somewhere in the British Museum. 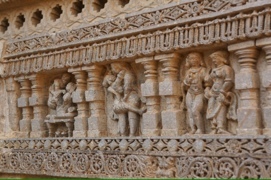 The temple itself is no longer active, but worth a visit for the ornate carvings – including a few rather racy ones that appear to have come straight from the kamasutra. It was built back in the mid-to-late 13th century by a general of King. Our guide, Ramakrishna, was a teacher in a former life, and seems determined that we grasp the basics of the Hindu pantheon. Each god or goddess has his/her specific symbols, a way for an illiterate public to know who they were worshipping, and Ramakrishna tests us at each statue we come to. Incidentally, if a statue has four arms or more, it’s probably a god – two arms, a mere human. Just in case you were wondering…! As we’re leaving, a large posse of school girls in matching sari uniforms arrives, on a history trip. Their English teacher is travelling with them, and sends them over to practise (all together now, “hellowhereyoufromwhatsyourname?”). 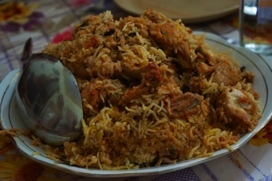 That night we have dinner at the home of one of Intrepid’s drivers, Raju. The table for twelve of us occupies the entire living space – even if they are being remunerated well (and this being Intrepid I’m sure they are), it’s not a small inconvenience to have the whole of your home taken over by twelve strangers on a weekly basis. The meal is simple and so tasty – an incredible chicken biriani, aubergine curry for the non-meat eaters, and a plump gulab jamun to finish (my new favourite dessert in the world – a ball of batter deep fried in ghee, then soaked with syrup – what’s not to love?!). Maybe he was saying to you : “My girlfriend, despite the fact that she only has 2 arms and therefore is obviously human, is a goddess to me” ???? Sounds like the entire trip is fab, Natalie. Will you ever leave at all? Or shall we have to come visit you there if we ever want to see you again?